This piece was originally published in the Uncanny. Since it pertains to our farm life, I’m re-issuing it here for this audience. My day, last Friday, began with a burial. I buried ram number 11058, his Animal Identification Number (AIN) tagged on his left ear. He was but 7 months old. To us, he was not 11058, rather he was “Manru,” named after a character in one of my son’s dark comedic scripts. Only Manru’s end was anything but comedic. A few days prior, almost overnight, his jaw became swollen, a sign that parasites had overtaken him. (The vet informed me he had 35,000 parts per gram; 500 parts is the limit. He was hit hard.) White Dorpers , which originate in South Africa and considered the best meat, are quite resistant to parasites. Not Manru, though; he showed a predilection. They are a warm, easy breed that doesn’t have a problem grazing around one’s legs and rubbing up against you. I often ran my hand over Manru’s shoulders and over his head; he seemed to like it and he’d stand for a bit taking in my touch. 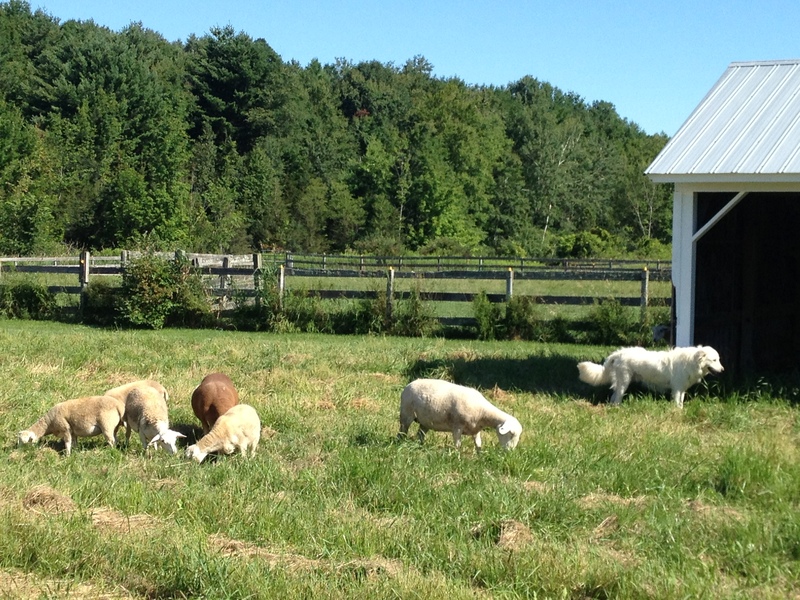 When the weather changes, here in VT, at dusk it’s cooler and the sheep are a bit friskier. Manru took to practicing what eventually would be his duty. The ewes didn’t mind; they just kept eating as if Manru was but a fly on their backs. But he tried. Manru always tried. 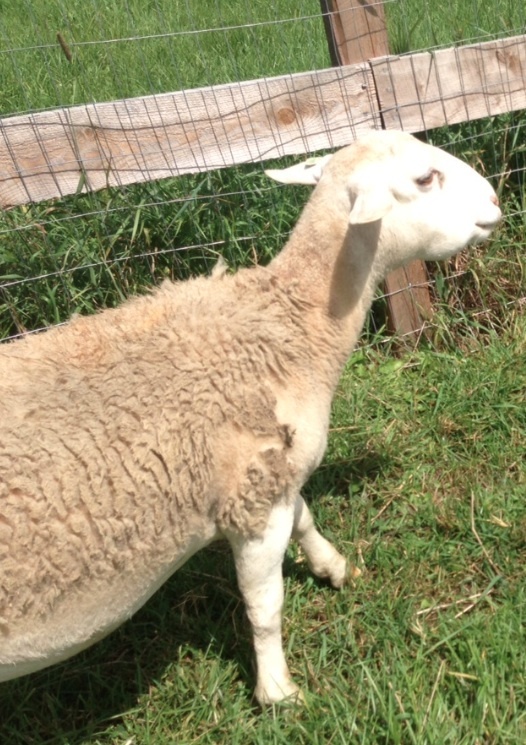 In his last week, along with multivitamins, vitamin B Complex, safeguard, RedGlo, and sheep drain, I fed him by hand, 3 – 4 times a day, a blend of organic grain and grasses and molases. After a feeding session, where I held his little head in my hands as I stood over him, he’d collapse from exhaustion. I placed water in front of him, but he hardly had energy to draw. 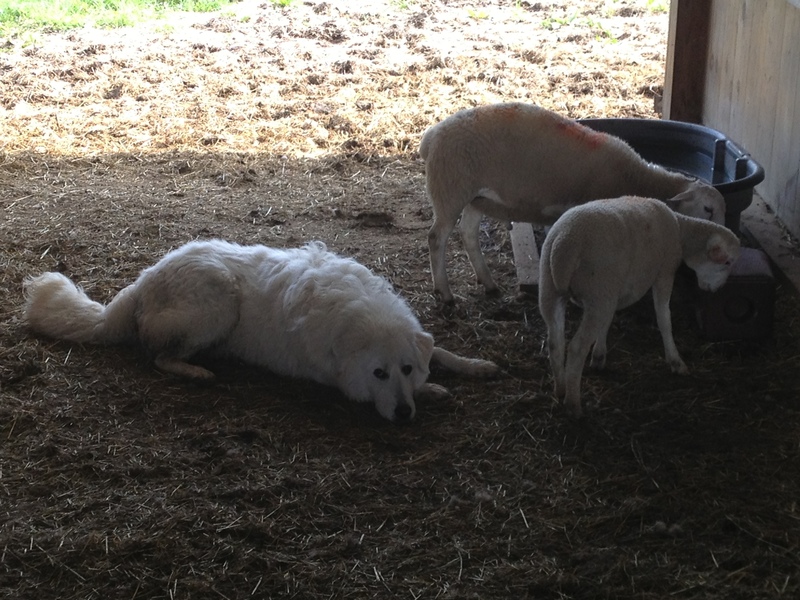 Aldo, our Maremma livestock guard dog, as things progressed, laid next to him, close enough to buttress him. When the other sheep grazed, Aldo laid in the cool grass between them, as if he was doing double duty watching out for the most vulnerable. After a feeding, I placed food near Manru just to urge him to try for more, and Aldo remained near, never touching the food. Aldo’s instinct humbled me – such knowledge, such understanding, something we can all learn from, I thought. Total trust in what he understood; there were no questions, just surety. 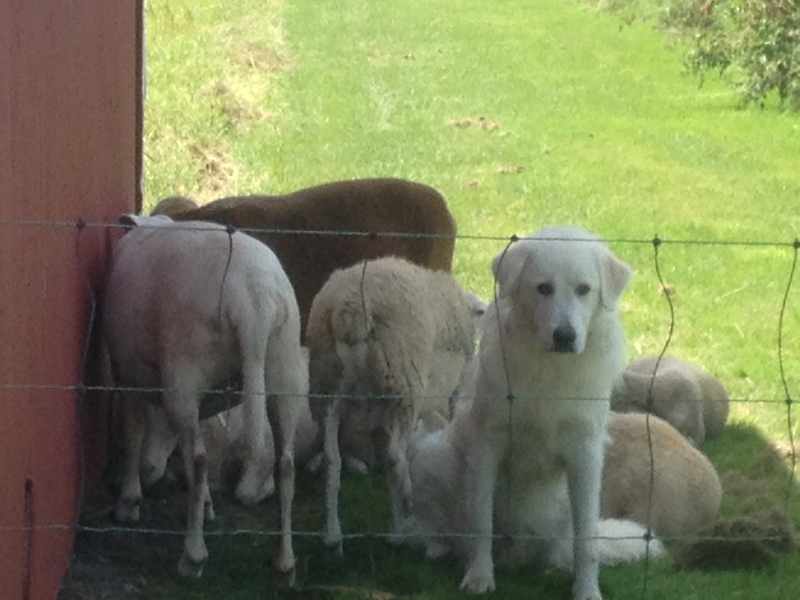 Then early Friday morning – it must have been 1:30 – 2AM – we heard Aldo barking in the barn. Aldo’s bark was different. When he’s guarding the sheep, especially at night, his bark is ferocious, chilling. But this morning’s bark was mellifluous, longer and it lasted for about 20 minutes. Then silence. My wife, Nina, turned to me in the dark and whispered, “Manru’s dead.” She heard the signs. I didn’t say anything. I knew what Aldo was saying – that instinct I trusted too. Aldo was calling out to us, telling us something had happened. On this humid day, gnats already flying about, I slid opened the barn doors. It was 6 AM. Usually, the sheep are resting, still lounging about waiting to see what I’m going to do. Instead they were all gathered as if in a waiting room; they looked like a group in deep discussion. The sheep like to hang in one large stall, one of 4 – but not today. The were all hovering in the center of the barn. Aldo came to greet me and quickly turned and ran through the sheep, opening a path to the stall – but he didn’t go in until I did, then he stood a few steps to my side and behind me, watching me and Manru. I looked at Aldo. He has an uncanny gift for a dog: he looks back right into your eyes. He looked at me, then at Manru and I got the strangest feeling that he was watching to make sure I was going to handle this correctly. Manru was in a corner leaning against a wall. He was stretched out. He was soft, restful. His eyes were gray, as if covered by a film. I knelt and ran my hand over his head, as I used to do, and then down his body. I felt his legs – then back again. And I placed my hand, finally, against his side. I knew I was touching what once was Manru; just as I knew that I was touching death, what death feels like. The silence, the image of what once was and is no more. That’s what death is, a memory, something you can’t quite have again, not fully and completely, not as I once had him up against my leg grazing as I scratched behind his head. No. That was over. That’s death. The sheep gathered at the stall’s open door but wouldn’t come in – they just stared. Manru was about 90 pounds and I lifted him onto a wheelbarrow and brought him to the back of the paddocks where I have a cemetery. Farms have cemeteries. Life and death are constant on a farm, something we rarely even consider. But we never get accustomed to seeing death face-to-face; we accept it, but it’s never something that’s welcomed. It is, however, understood. The supreme commander. The end of everything known. Just the other day, an acquaintance, knowing what had happened, said to me, “I could never raise livestock. It’s too painful.” I of course wondered what she thought was on her dinner plate when she ate meat and poultry. Death is even prevalent on vegetable farms; it’s an ongoing cycle of life into death and back again. One informs the other. Only we forget that. We’re scared of death when it’s up close; we’re even frightened of it when it’s off at a distance. We’re also very scared of what’s real; that is, we’re scared to know what it takes to raise an animal so that it completes its lifecycle, helping you complete yours. They’re cycling through too. We’re all so interconnected – everything is connected. This is one reason why industrialized farming has gotten out of control. We have been educated into not wanting to know, not wanting to see, not wanting to experience. Of course, this way of existing has tentacles and it reaches all aspects of our lives – then we say things like, Well, it’s the new normal, or, Well, I’m lazy I don’t want to know, I prefer not to, or, Well, I’m glad someone’s doing it, just not me, or, perhaps one of the worst, I don’t want to know what’s on my plate. I do. I want to know. I’m reminded of the old Holiday Inn ad. Remember? What’s so great about the Holiday Inn, said the ad, it’s the same place wherever you go. That’s what we want. No surprises, a prophylactic that’s called sameness; it’s why fast foods are so popular – a McDonald’s in New York is the same as one in Los Angeles, and points in-between. We don’t want variation because it requires we become acquainted with change – and we’re always changing, cycling towards death. That’s too much for a culture that’s embraced the spectacle as life itself. A constant diet of this leaves a residue, a kind of heavy resistance for what’s real and natural; it’s an act of collective repression that annihilates inquiry, critical thought and dialog. It also creates a culture that’s easy to deceive. The ground was heavy with tall grasses and rocks as I shoved my shovel into the soil. I was drenched in sweat by the time I finished the hole for Manru – 3 & 1/2 by 3 & 1/2 by 3 feet, deep enough to deter coyotes, foxes, wild dogs from wanting to dig him up. They’re cycling through too. We’re all so interconnected. I looked up and realized that his resting place was 10 feet from Amos’, our German Shepherd that passed 4 years ago. And he was just a few feet from George, the 3 legged cat. The cemetery. I placed Manru in his hole – no other way to really say it. His hole. Our hole. A hole – just that. Earth to earth, right? The dark hole of eternity. I covered him over, placed some rocks over the mound so I could go back from time to time after the dirt settled, and I walked off and gathered the sheep and moved them to a fresh paddock for grazing. Life doesn’t stop. It just changes a bit every so often and we’re tested – can we adapt to the changes, can we adapt to the surety of where we’re headed? How are we spending our brief moment here? What do we value and why?